Maresa Ness, Chief Executive of Mosaic Clubhouse (hosts of the Living Well Partnership in Effra Road, Brixton) has clinched the prestigious COLLABORATION (INTEGRATION) AWARD in the Third Sector Care Awards, organised by CMM (Care Management Matters). This comes hot on the heels of Mosaic Clubhouse, as part of the international Clubhouse community being awarded the world’s largest humanitarian award, the Conrad N. Hilton prize worth 1.5 million dollars, presented to organisations that are doing extraordinary work to alleviate human suffering. Maresa received her award (sponsored by Bollington Insurance) from top TV host Esther Rantzen- herself appointed a Dame Commander in the New Year’s Honours List – at a ceremony at the London Marriott Hotel. The judging panel includes people who have experience of using care services and this year welcomed Experts by Experience from Choice Support and the Royal Hospital. The Judges’ statement praised Mosaic for its “seamless approach; where all individuals (staff and people with lived experience) are valued adults and where there is true equality in support. An organisation that does not see barriers but opportunities. An organisation that is solutions based. An organisation that builds proactive relationships with local communities, CCGs (Clinical Commissioning Groups) and Primary Care, Forensic services, criminal justice and rehabilitation, and in-patient services. Mosaic Clubhouse was described by NEF (National Economics Foundation) as one of two of “the most powerful examples” of co-production in mental health. In a recent report by NEF, commissioned by Mind (NEF 2013) co-production at Mosaic was featured as an example of best practice and described as a ‘user organised and run peer network’. 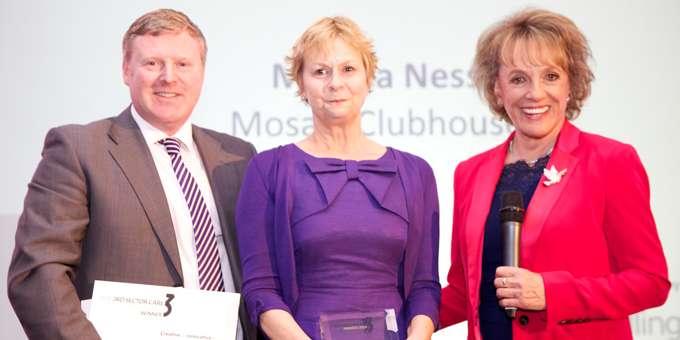 Maresa is pictured above with Esther Rantzen and Carl Shaw, Commercial Director from Bollington Insurance, who sponsored the award.